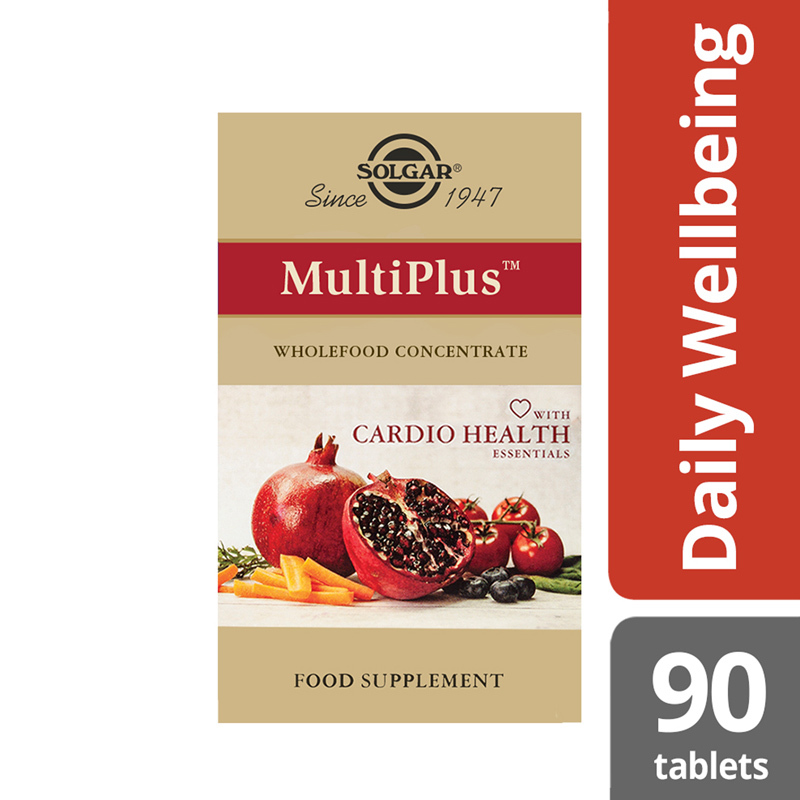 Solgar® MultiPlus™ with Cardio Health Essentials is the next generation in wholefood based nutrition with vascular health in mind. 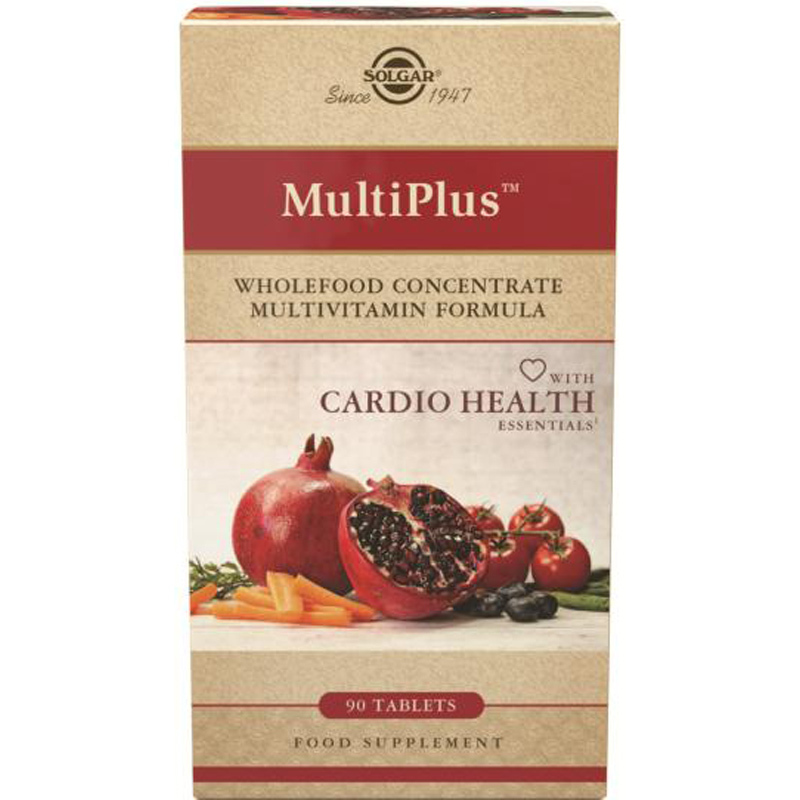 With a broad spectrum of vitamins, minerals, phytochemicals and wholefood concentrates. 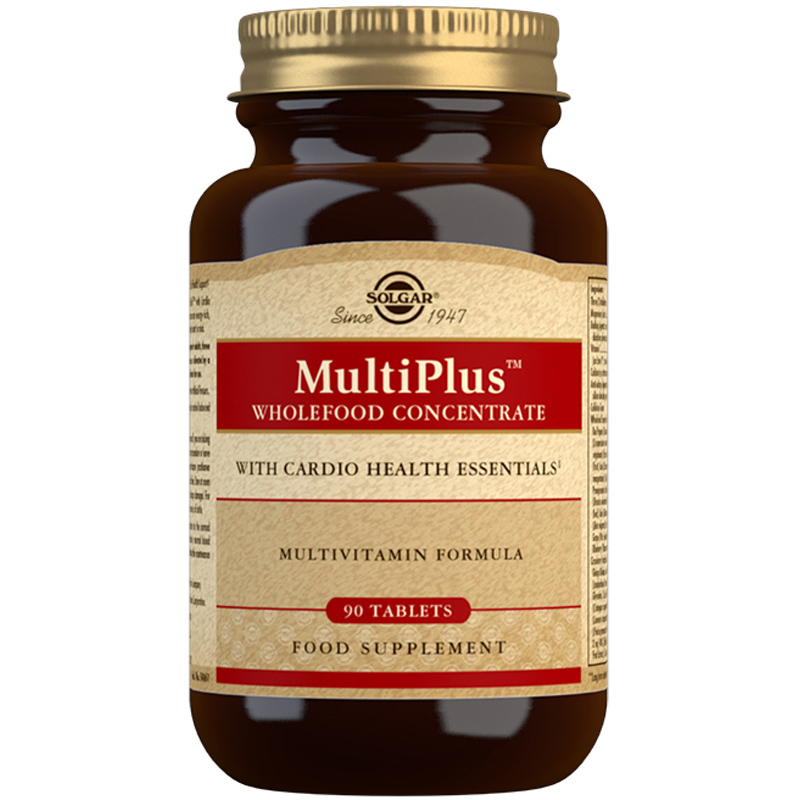 Magnesium (as citrate), Bulking Agents: (microcrystalline cellulose, maltodextrin, dicalcium phosphate, citric acid, gelatin (from fish gelatin)), Vitamin C (as Ester-C®, calcium-L-Ascorbate, ascorbyl palmitate), Calcium (as citrate, ascorbate, carbonate), Anti-caking Agents: (vegetable stearic acid, silicon dioxide, vegetable magnesium stearate), Cellulose Gum, Wholefood Energy-Rich Complex [Red Pepper (Capsicum frutescens grossum) (fruit), Tomato (Lycopersicon esculentum) (fruit), Strawberry (Fragaria virginiana) (fruit), Cranberry (Vaccinium macrocarpon) (fruit), Acai (Euterpe oleracea) (fruit), Mangosteen (Garcinia mangostana) (fruit), Goji (Lycium barbarum) (fruit), Pomegranate Extract (Punica granatum) (fruit), Broccoli (Brassica oleracea italica) (aerial), Spinach (Spinacia oleracea) (leaf), Kale (Brassica oleracea acephela) (leaf), Beet (Beta vulgaris) (root), Carrot (Daucus carota sativa) (root), Grape (Vitis vinifera) (fruit), Pumpkin (Cucurbita pepo) (fruit), Blueberry (Vaccinium corymbosum) (fruit)], Circulatory Herbal Complex [Ginkgo Biloba (Ginkgo biloba) Leaf Extract (standardised to contain 24% Ginkgo Flavone Glycosides, 6% Terpene Lactones), Hawthorne (Crataegus oxyacantha) Berry Extract (4:1), Motherwort (Leonurus cardiaca) Extract (5:1) (aerial), Pomegranate (Punica granatum) Extract (peel) (standardised to contain 40% Ellagic Acid), Amla (Phyllanthus emblica) Fruit Extract, Cayenne (Capsicum annuum) Powder (fruit)], Kaneka® Coenzyme Q-10 (ubiquinone), Inositol, Zinc (as citrate), Fish Oil (containing Omega-3 fatty acids: tilapia, tuna), Niacin (vitamin B3, as inositol hexanicotinate), Pantothenic Acid (as D-pantothenate, calcium), Manganese (as gluconate), Vitamin B6 (as pyridoxine HCI), Thiamin (vitamin B1, as thiamin mononitrate), Vitamin E (30 IU, as D-alpha tocopheryl acid succinate), Glazing Agents: hydroxypropylmethyl cellulose, vegetable glycerin (from palm kernel oil and coconut oil), Riboflavin (vitamin B2), Polygonum cuspidatum Root Extract (providing resveratrol), Rutin, Grape Seed (Vitis vinifera) Powdered Extract (seed), Citrus Bioflavonoid (Citrus spp.) Complex (whole fruit), Boron (as boric acid), Colours: chlorophyllin, titanium dioxide, Natural Source Beta-carotene, Copper (as citrate), Vitamin A (as palmitate), Folic Acid (as pteroylmonoglutamic acid), Chromium (as picolinate), Vitamin B12 (as cyanocobalamin), Iodine (as potassium iodide), Selenium (as L-selenomethionine), D-biotin, Vitamin D3 (as cholecalciferol).